It was a steamy June night in Toledo, the Spanish city perched dramatically on a rocky bluff and bordered by the gracefully curving Tagus River with its grand stone bridges dating back to Roman and medieval times. Lafra, a Croatian-Hungarian-Bulgarian ensemble, onstage in Cordoba in 2011. Photo by Hedy Weiss. Earlier in the day, despite a scorching sun, the steep, narrow, heavily cobblestoned streets of this Unesco-designated World Heritage Site city were bustling with locals and tourists as preparations were under way for the upcoming Corpus Christi festival. Cloth canopies and flowers were installed along the processional streets, marking the way to Toledo Cathedral, a massive gothic edifice. Around 10 P.M., as Spanish nightlife invariably begins to move into full swing, a flow of pedestrians began massing from all directions, heading toward the Plaza del Ayuntamiento adjacent to the cathedral. Families with kids, young couples, teenagers, old people—all were on their way to see Ara Malikian, a Lebanese violinist of Armenian descent who lives in Madrid. A virtuoso musician with a rock star-like wild man quality, for more than two hours Malikian played Rimsky-Korsakov, Rachmaninoff and Syrian classical music. He jammed with an Indian tabla player and a Spanish flamenco guitarist. And he drove his audience to its feet with a rollicking set of klezmer music. The program contained no songs in Ladino, the Judeo-Spanish language, but I would hear those songs a few days later in the Andalusian city of Cordoba—all part of a Spanish Tourist Office-sponsored trip to two major centers of Sefardic history. Sitting in that plaza, it was impossible not to muse on the crazy-quilt contradictions of the history of Jewish life in Spain, or on the multicultural legacy of the Sefardim who were forced to flee the kingdom in 1492—the momentous year when King Ferdinand and Queen Isabella, exulting in finally seeing the Moors driven out of Granada, quickly proceeded to expell the Jews from the Spanish kingdom, too. The expulsion, ordered in the very same month the royal pair financed Columbus’s journey to the Indies, resulted in the dispersal of one of the largest and most influential Jewish populations in Europe at the time. While some of Spain’s Jews converted or lived secret double lives as Conversos, most became part of a diaspora in North Africa, the Ottoman Empire (particularly Turkey and Greece) and beyond. Yet now, traveling through Spain more than five centuries later, it is easy to conclude that once planted, cultural roots have a way of growing back in unexpectedly potent, if sometimes twisted, ways. Ironically enough, it was during the era of Muslim rule in Spain—the 8th through the 11th centuries—that Jews had what is now referred to as their Golden Age, both in Toledo and other cities. And well after the Christians conquered Toledo in 1098, they remained an intellectual, cultural, commercial and financial force, working both in the open and behind the scenes, often in positions of significant power. Of Toledo’s population of 50,000 at the time, it is believed that 15,000 were Jews. Today, Toledo, a city of about 83,000, has an all but nonexistent Jewish population. Yet as a major stop on the Route of the Sefardim (www.redjuderias.org)—the network established in 1995 as part of Spain’s attempt to reclaim its Jewish history and generate tourism, and that has now grown to include 21 cities—you can discover some extraordinary signposts of a once flourishing community. In Toledo, these signposts, found mostly in the Jewish district in the southwestern part of the old city, range from two beautiful but quite different synagogues to a slew of narrow, mazelike streets that still hint at the Middle Ages. And if you are traveling in the company of a well-informed guide (such guides are few and far between when it comes to explaining the finer points of Jewish history, particularly the legal inequality of Jews that was part of the modus operandi even in the best of times), you also will learn about the Toledo School of Translators. 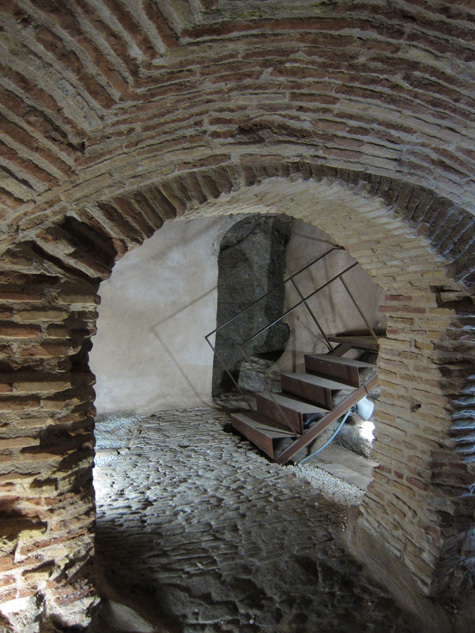 The recently rediscovered ancient mikve in Toledo. Photo by Hedy Weiss. Though imagination is often essential in piecing together Toledo’s Jewish history, the two synagogues are tangible reminders of the once formidable Jewish presence, even if their architecture might suggest you have entered a mosque by mistake. See Toledo’s tourism office online (www.toledo-turismo.com) for visitor information on all city sights. The oldest of these buildings, now a church turned museum, is the Santa Maria la Blanca, or Saint Mary the White. Built in 1203 and designed by masterful Moorish architects, its lacy white interior is a captivating and welcome respite from the blazing sun. This basilica-like structure (which notably lacks a women’s gallery) is configured with five naves separated by rows of delicate horseshoe arches, all balanced on octagonal pillars topped by intricately carved plaster capitals. The overall effect—intensified by a dark red floor embedded with decorative tiles—suggests a fanciful forest as much as a house of worship. It is believed that the city’s kosher slaughterhouse and butchers stood near the Santa Maria synagogue, though there is no visible evidence of that today. But a relatively short walk will bring you to Calle de Samuel Levi. And there you will find the Sinagoga del Transito, which was built in 1357 and served as the center of the city’s Jewish life in the 15th century. It was Levi, the royal treasurer, who financed the construction of this sanctuary with its façade of brick and stone. Inside you will find a vast rectangular space with richly decorated, painted stucco walls in Arabic style, an exquisitely coffered pinewood ceiling and a large women’s balcony. The eastern wall contains the Ark, in the form of a niche with columns and arches. Following the expulsion, and up until the early 20th century, the synagogue was used variously as a hospital, a priory and, during the Napoleonic Wars, a military barracks. 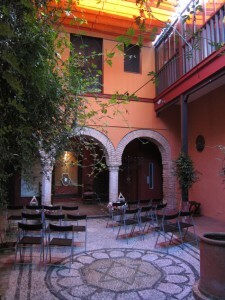 Now it connects to a series of adjoining rooms and a courtyard that house the Sefardic Museum of Toledo. Founded in 1964 and modernized over the past decade, this is an ideal place to begin any tour of Sefardic life. The museum’s permanent exhibits contain archaeological material and artifacts that trace the Jewish presence in Spain from Roman and Visigoth times through the Muslim period and go on to deal with matters of conversion, the Inquisition and expulsion. The women’s balcony area is devoted to post-expulsion life, revealing how Jews absorbed the cultures of the many places in which they resettled, with cases full of menoras, shofars, wedding outfits and lavish jewelry from Turkey, Morocco and beyond. One benefit that comes with having an official guide is that he or she will have the key to a recently found treasure just a block from the museum. Behind a nondescript door you take a few steps down to what served as the wine cellar for a private home, which is now known to have previously housed a mikve. Of course, it might just be the cuisine of Toledo that serves as the richest reminder of Jewish life in Spain, and many restaurants now offer special Sefardic menus (they need to be ordered in advance), complete with kosher wines produced in Spain. The restaurants, however, do not have kosher certification, and some may serve meat as well as dairy specialties. At the Parador de Toledo (www.parador.es), whose balcony offers spectacular panoramic views of the city, you can dine on almond-garlic soup served in a shot glass and fish with green sauce and asparagus. Or stop for a heavy, nap-inducing lunch at the bustling Cason de los Lopez (www.casontoledo.com), where you can order a rich ratatouille, a gargantuan portion of roast leg of lamb and thick slices of crispy eggplant. (Cervantes, you might remember, referred to Jews as the “aubergine [or eggplant] lovers.”) Or consider saving both your appetite and your euros for a dinner at Locum (www.locum.es), the five-star restaurant in a narrow, multilevel old Arab house near the cathedral. 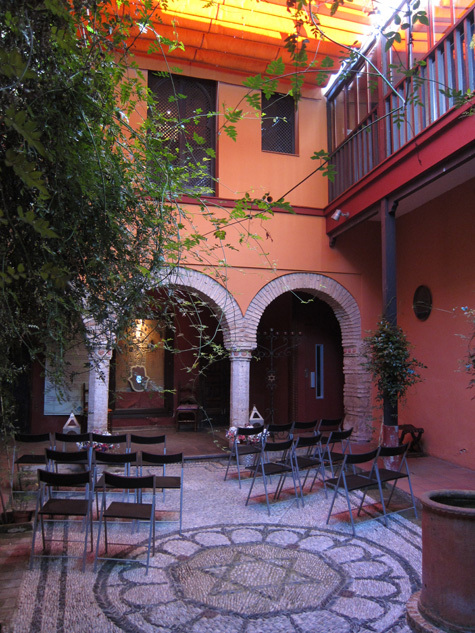 Casa Sefarad in Cordoba. Photo by Hedy Weiss. Locum is where prizewinning chef Victor Sanchez-Beato whips up a divine modern take on Sefardic cooking that includes a melt-in-your mouth strip of rolled lamb nestled in kadafi (shredded pasta) and an irresistibly airy marzipan lava cake served with blueberry-manchego cheese ice cream. Sommelier Eduardo Gallardo can recommend the ideal kosher, or nonkosher, wine accompaniment. Toledo’s marzipan is unquestionably the city’s omni-denominational treat and bears no resemblance to the thick almond paste variety of Middle European bakeries. Mazapanes Santo Tome is the most famous local purveyor of this treat (www.mazapan.com). It is a distance of about 215 miles from Toledo southwest to the Andalusian city of Cordoba. And while you can get there easily by way of a high-speed AVE train, driving enables you to stop and snap photos of the fabled windmills of La Mancha and to visit the grand square in the lacemaking town of Almagro. Cordoba, also a World Heritage city, is sprawling and modern, with strong Roman and Islamic roots. Its mazelike medieval Jewish quarter, located just inside the walled Puerta del Almadovar (formerly the Puerta de los Judios), is in close proximity to the Mezquita-Catedral—the enormous, conjoined Great Mosque and cathedral that is one of the more amazing architectural complexes in the world. And a room at the five-star Hotel Las Casas de la Judería (www.casasypalacios.co/es/cordoba), housed in a collection of 17th- and 18th-century buildings, puts you at the very heart of history. For information on visiting sights in Cordoba, go online to www.turismodecordoba.org. Long heralded as the place where the three religions once lived in unusual harmony, Cordoba was the birthplace of Moses ben Maimon, called Maimonides (1135-1204), the great Torah scholar, philosopher and physician. A statue of this man, whose codification of Jewish law and ethics remains an essential part of Jewish thought, lies in a tiny square in the heart of the Jewish district. Like many Jews, Maimonides and his family had to flee Spain and, after many stops, ended up in Egypt. Not far from the statue, on a narrow street lined by whitewashed buildings, you will find Cordoba’s only surviving synagogue. Built in 1315, it is another lovely example of the Moorish style—a creamy white sanctuary with raised stucco walls bearing traditional geometric and vegetal patterns and Hebrew inscriptions from Psalms. And “a dead thing” it most certainly is not. Proof could be found at Cordoba’s annual International Festival of Sefardic Music, now in its 11th season. Held every June in the city’s Botanical Garden, where 500 tightly packed plastic chairs set up in a tree-framed patio area become some of the hottest seats in town, the festival attracts musicians (and audiences) from around the globe. This weeklong showcase not only suggests that Jewish music is very much alive and well, but that it is often on the cutting edge even when deeply rooted in tradition. It is also a reminder that Sefardic music now eludes any neat definition. It has a world beat, fed by the influence of flamenco, Arabic, Indian, Balkan, contemporary Israeli, Romany and much else. I attended three different concerts in 2011, with the first featuring Berry Sakharof (a composer, vocalist and instrumentalist long considered one of Israel’s top rock stars), his percussionist Rea Mochiach and their dazzling fellow musicians in a thrilling performance of Sakharof’s fiendishly complex evening-long 2009 work, “Adumei Hasefatot” (Ruby Lips). The piece is based on the 11th-century Hebrew poetry of Rabbi Solomon Ibn Gabirol, born in nearby Malaga just when Jewish life was thriving in Muslim Spain. Sakharof, whose music (and demeanor) suggest a mix of Leonard Cohen and Philip Glass, layered strings, percussion, clarinet and haunting vocal work to create a sound at once sacred, profane and rhythmically stunning. Sitting near me was carmen arroyo, a 34-year-old Cordoba native and a history major with excellent English. “I feel very sad about Jewish history in World War II,” said Arroyo, who acknowledged that it is “difficult to meet Jewish people in Spain.” She said she had seen many documentaries on Spanish television about the Holocaust and hopes to visit Israel someday. A second concert featured Lafra, a Croatian-Hungarian-Bulgarian ensemble based in Madrid that specializes in both Sefardic and klezmer songs. It is led by the engaging singer, Jasmina Petrovic, accompanied by violin, accordion, clarinet and percussion. The Serbian-Israeli fusion group Shira u’tfila took to the stage on the third evening of the festival for a program of Judeo-Spanish, Ottoman Turkish, Arabic and Balkan music. Playing on an array of ethnic and classical instruments, one member of the group is a sensational Indian tabla player who lives in Belgrade with his Serbian wife. “We in the community make it together,” he said. It was a sweet, chewy loaf full of raisins. And several American tourists joined him as he blessed the bread and wine. Hedy Weiss is theater and dance critic for the Chicago Sun-Times.